6 CDs. 6:56 hrs. Brilliance Audio. May 2018. $21.99. ISBN 9781543687385. digital download. Gr 8 Up—Miss V Conroy is a young girl sent by her father—Sir John Conroy, the comptroller and confidant for the Princess Royal's mother—to befriend the future Queen Victoria at Kensington Palace. Victoria is stifled under a strict set of rules called the Kensington System, which keep her locked away from public view, isolated and lonely. Miss V's father assures her it is for Victoria's safety and requests that Miss V pass along details of their conversations. However, as the girls' friendship blossoms and Victoria nears the crown, Miss V begins to doubt her father's true intentions. Power struggles permeate Victoria's life with her mother and Sir John hoping to continue exerting influence and matrimonial choices, her Uncle Leopold voicing his own opinions, and Victoria wishing to be free of all of it. 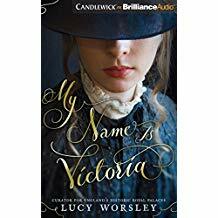 Worsley boasts expertise as the joint chief curator at the Historic Royal Palaces, and she speculates on Victoria's childhood and vividly brings it to life—albeit with some twists that classify this imagined perspective as an alternate history. Henrietta Meire narrates with ease, making for a pleasant listening experience. VERDICT A solid choice for libraries desiring more historical fiction that will especially appeal to fans of the British monarchy.